Artist Code 1407. Completed 4 October 2014. Original SOLD. Water colour on Aquarelle Arches 100% Hot Pressed cotton rag paper. Unframed size 12” x 16”. 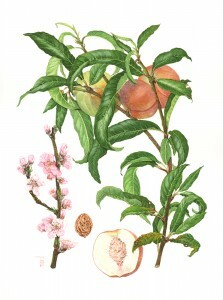 Brief was to produce a very accurate botanical illustration of a peach, including ripe fruit, branch, blossoms and cross section. The live foliage and fruit was provided by a near-neighbour and the blossoms from an old photograph I had. The commissioner was very happy with the result. 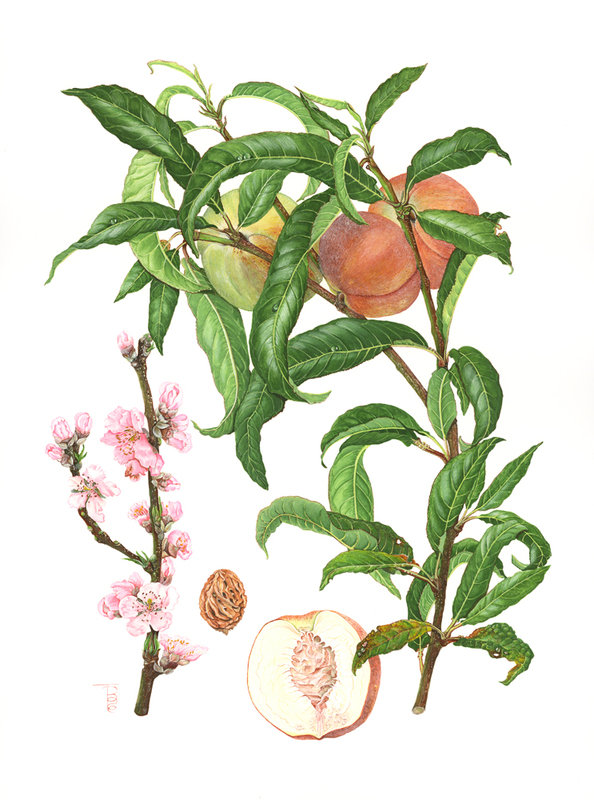 The painting was commissioned as a birthday present for a very dear friend in China so I had to look up the background regarding Chinese history and the peach and discovered that it was to indicate (and wish) longevity for a particular person, and that all components, i.e. leaves, flowers, fruits etc should be in odd numbers rather than even, and that the blossoms should show buds as well as fully-out blossoms to indicate nature’s growing cycle. Are glad to eat them for our tea!